Where to Buy Gypsum Micro Prill, Gypsum Micro Select Prill - 50 Lb - $51.95 for Sale with Fast Free Shipping! Gypsum Micro Select Prill - 50 Lb use to loosen those heavy, hard-packed soils allowing moisture and air to penetrate and move freely in the soil, improving conditions for hearty lawns and gardens. Turf Mark Spray Indicator Blue Colorant Dye.. Apply Gypsum to counteract the harmful effects of ice-melting salts and repair pet yard spots. 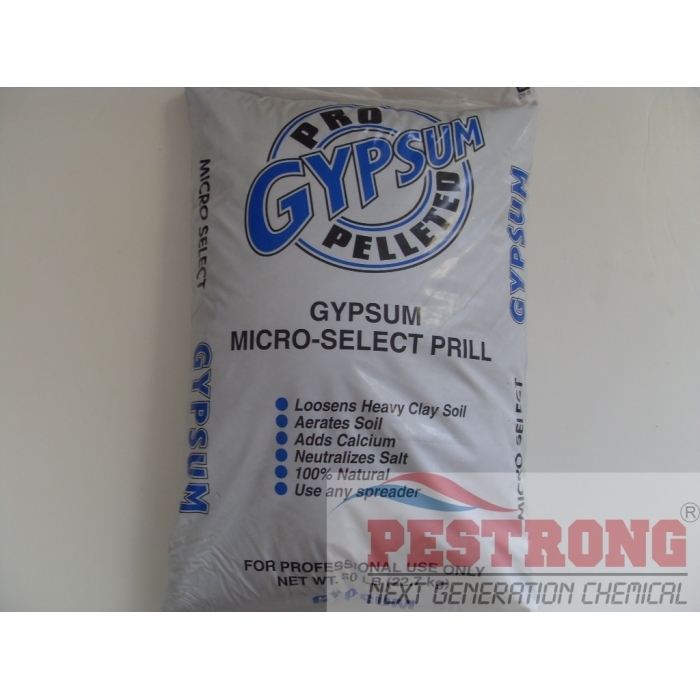 Gypsum Micro Select Prill is better than pulverized gypsum products normally used because of its fine grind. Afiner grind causes the product to work faster and more effectively. Gypsum Micro Select Prill-50lb is first ground to a flour-like powder and then is made with a moisture-activated binder to form dust free, fertilizer-sized pellets that quickly dissolve when added to the soil. Gypsum is pH neutral and will not increase soil pH and may lower (or reduce) soil pH of unproductive, highly alkaline sodium soils. Gypsum Micro Select Prill-50lb contains sulfur and calcium, two essential nutrients for plant growth. New Lawns: Apply 80-100 lbs. per 1,000 square feet before seeding. Rake or till thoroughly into top 3 of the soil. Use higher rate for high clay soils. Established Lawns: For corrective action, apply 40 to 50 lbs. per 1,000square feet in the spring and again in the fall. Use 80 to 130 lbs. per 1,000 square feet of this product on higher clay or heavily compacted soils. Maintenance applications should be repeated 1-2 times per year, spring and fall, at a rate of 6 to 12 lbs. of product per 1,000 square feet to maintain proper soil conditions. Gardens: Mix in 20-30 lbs. per 100 square feet and water thoroughly. Roses: Place 0.5lb - 1lb around the bush every year. damaged areas and apply 1/2 - 3/4 cup per square foot for small spots. adding 1lb more cups per day until complete (approximately 1 1/2 weeks). We applied it on our farmland and it worked very well. We were very pleased with the results.